One of the functions of this blog is to serve as a sounding board for ideas to eliminate the use of carbon based fossil fuels in transportation and other energy uses. There are several problem areas, areas for which no good substitute offers itself. One of those areas is shipping. Of course if we eliminate oil as a fuel source, there will be a whole lot less shipping, because a lot of shipping has to do with moving oil around, but shipping freight is still a problem. The candidates for alternative power source would seem to be nuclear and solar. I know that Rid Adams would like to sell anyone who asks an Adams Atomic Engine. So lets hope that Rod does a lot of business. What about renewables? Well PV is always a possibility. We could have solar powered ships. Thy would require overnight electrical storage, and big batteries are expensive. Solar might not have a significant cost advantage over nuclear. What about wind? Sailing ships were, and are highly complex objects. Operating traditional sailing ships is far more manpower intensive than than operating modern oil powered vessels. There is also, I believe, a problem with size. The largest sailing ships have been in the 5000 ton size. The German Preussen, was capable of carrying 8000 tons of cargo, and required a 40 person crew. The design of the modern, and equally large sail powered cruse ship the Royal Clipper is based on the Preussen's. The Great Eastern was designed with sail, but she was really a steam ship. The Great Eastern's sails tended to catch on fire when they were set, because the funnel exhaust was hot enough to set canvas on fire. There is, however another approach to wind. During the 1920's the German inventer Anton Flettner set out to prove that ships could be sailed using the Magnus effect. The Magnus effect is an aerodynamic phenomena produced with a cylinder spins in a wind. Air pressure on one side is reduced and thus a movement force is applued to the cylinder. Flettner attempted to demonstrate that the Magnus effect could be used for ship propulsion. He rebuilt a sailing ship with two rotating cylinders (or rotors) about 15 meters high and 3 meters in diameter. Rotation was applied to the cylinders by a small engine. The ship appears to have been sucessful, and even crossed the Atlantic. From an energy viewpoint however the experiment proved unsucessful. More engine power was needed to turn the cylinders, than would have been needed to turn a propeller to produce the same speed. Flettner accomplish his purpose by the demonstration and then went on to other inventions. But in the United States, Laurence J. Lesh, a pioneer aeronautical engineer, had another approach. Rather than use cylinders that were rotated by an engine, Lesh designed wing like airfoils, that were rotated by the wind. There were mounted upright, like Flattner's rotating cylinders. Lesh conducting wind-tunnel tests, and experimented with a model rotor ship in a model boat basin. He concluded that his roters would provide 4 times the propulsive force of traditional sails. Unfortunately Lesh appears to have never completed his full sized boat. 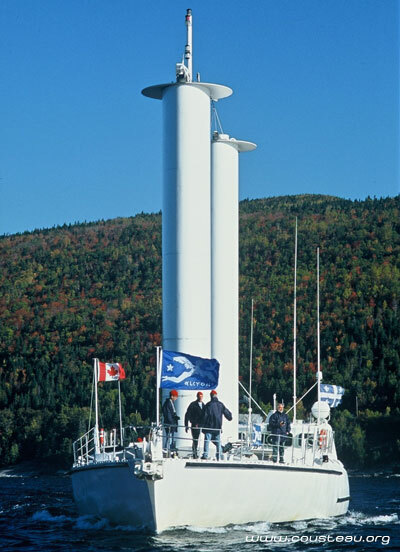 Jaques Cousteau attemped to revive some of Flettner ideas in the 1980's with the "turbosail" system. Cousteau claimed that his system was 5 to 6 times more efficient than ordinary sails. The initial experiment failed because of materials problems, but Cousteau presisted and built the Alcyone (see above). Cousteau claimed that the Alcyone achieved a 35% fuel savings compaired to ordinary boats. Interest in Flattner's concept clearly continues. The rationale was that the ship could shut off its engines and cruise near silently, making it an exceedingly effective ASW platform. The project is briefly mentioned in Rebuilding the Royal Navy by D.K. Brown. With a more austere or energy efficient sonar array and/or batteries charged intermittently by a generator (like a submersible) the concept might yet have a bit of merit. More on modern sail proposals (and all manner of alternate propulsion tech) here.